In the modern-day healthcare ecosystem, EHR has made it possible for information to be made available instantly and securely to the intended and authorized user. GEMMS, an acronym for Gateway Electronic Medical Records System, provides intuitive and robust EHR systems for cardiology practices across 35 states in the U.S. Its software solutions allow patient scheduling, billing, and clinical documentation along with managing millions of active patient charts for over 20 years. Their journey started back in 1997 when Co-Founder, President and CEO, Rodger Pinto was serving as the clinical director of a cardiology program in Indiana. Having expanded to multiple locations in a very short span of time, his firm began to lack efficiency and coordination. Soon he realized that such an impediment was prevalent in almost every medical facility; there was a burning need for a medical record system that is equipped with wireless internet connectivity and could link multiple offices into a single inventory and streamline the workflow. Two years later, GEMMS was formed as an independent organization and launched the most innovative enterprise EHR product of its time using wireless tablets and cloud-based networking. “We understand that information technologies in healthcare need to create a balance between creating efficiencies for providers, increased quality for patients, and still meet the rigorous standards imposed by the government and payers,” stated Dr. Pinto. As a case in point a large Cardiology Practice in the Atlantic Coast Region was using a generic product for medical healthcare records management for over five years and never received any Return on Investment (ROI). 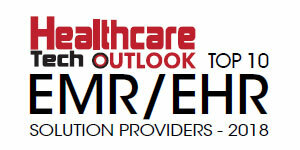 But, after they utilized GEMMS’ EHR platform, they got phenomenal ROI within the span of a year. This is one of the reasons that GEMMS has a very loyal Customer base. Recently acquired by Harris Computer Systems, GEMMS is about to use its considerable knowledge and expertise and roll out another innovative product for healthcare, the remote patient monitoring multi-diagnostic platform. This platform includes the Vitals360 multi-diagnostic device that is portable and equipped with both 4G LTE cellular and Wi-Fi connectivity. It is the size of a smartphone and can be utilized to collect a patient’s temperature, blood-pressure, pulse oximetry, glucose, HR, weight (via a digital scale), as well as an electrocardiogram. The patient data immediately is sent to a secure cloud hosted data center and then dispersed to any providers or entity’s clinical information system. GEMMS will also offer a patient management software console that includes provider and patient portals with patient risk stratification, that uses real time physiological and patient self-report, to assist in managing chronic and at-risk patient populations and to assist providers in documenting appropriately for reimbursement. “We feel this new technology continues the original mission of GEMMS, which is to provide the right information at the right time to assist physicians to make the right decisions,” stated Dr. Pinto. With the trend in medicine to treat the patient in the least restrictive and least costly environment, GEMMS is betting on their innovative Remote Patient Monitoring platform. Their track record makes them a good bet.